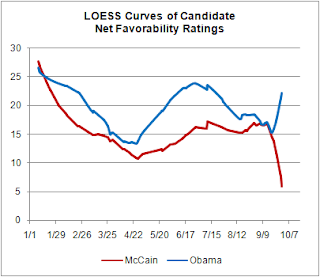 It may be quite difficult for McCain to attack Obama in this fashion without significantly damaging his own brand. This is an obvious point, but If McCain is going to get back in this race, he can do so in one of two ways: (1) he can win over undecideds or (2) he can change the minds of those who are currently planning on voting for Obama. Despite the fact that McCain is only down by 5-7% nationally, time is running out and a comeback seems like a tall order. In the new era of partisan polarization, major October shifts in the presidential polls are unlikely. There are few undecided voters left to persuade at this point and in recent elections we've seen that few voters change their minds once they have settled on a candidate. McCain’s standing in the polls has declined even more in the last week, and the major national polls now show him behind by 6 to 12 points. Silver has argued that "the principal reason why McCain has been able to remain in a relatively tight race with Obama, even as the Republican brand is in shambles, is because he has largely been able to distance his brand from that of the Republicans." As his campaign has descended into Rovian circles of Hell, McCain has lost that aura that kept him above the Republican fray in the primaries. I don’t think McCain’s late attacks will work. Those determined to stop Obama threw everything they had at him in the spring. It didn’t stick. His critics then said he couldn’t win over Hillary Clinton supporters. He did. The polls have made liars of those who said that working class whites wouldn’t go for him. Two weeks ago, the idea he could win Virginia seemed like a stretch. Now some polls have him pulling ahead in Florida and North Carolina. Each one percent of the polling represents about 1.25 million likely voters. If John McCain hopes to overcome the gap in the polls, he will have to do it by engaging citizens on things they care about instead of trying to change the subject.